This domain produces wines full of naturalness and humanism, without searching for extremes. What sets Faugères apart amid the labyrinth of Languedoc appellations are two things: its geology of schist, and its high elevation. Relative to other Languedoc appellations, it’s also small and rather stunningly compact, being one of more than twenty appellations in Languedoc but owning less than 1% of the total vineyard surface. This meager percentage encompasses seven village communes in a solid block along the first ridge of the Cevennes Mountains inland from Béziers. Faugères’s rock was originally sedimentary and layered. By heat and compression, it underwent metamorphism to turn into gray-blue schist, and then got heaved up on its side as the Massif Central pushed upward. This angle of repose allows the vine roots to penetrate deep between the layers of this dark stone in their search for water. The stone, and its heights above Languedoc’s swath of plain, give red wines here a black fruit profile, one that runs vertically with sleek, even slick, texture. (By contrast, wines produced from limestone terroirs in neighboring Saint Chinian emphasize red fruit, and run on a more horizontal plane, often with more robust, chewy tannins.) Paired with Languedoc’s soaring verdant aromatics, it’s a profile that makes for wines with compelling personalities. This is especially true for wines coming from vineyards in the highest zones of Faugères. The city of Béziers lies just over a dozen miles from the southern edge of the appellation. That distance takes you across the plain of Béziers and up onto what Andrew Jefford calls Faugères’s ramp of schist. The first village in the appellation is Antignac, and from there the road continues climbing to pass Laurens and continues ever steeper until reaching the top of the ridge, and here is where you find the village of Faugères. At that point, the road crosses the ridge and falls sharply down its north side into the valley of the Orb River. Most of the vineyards are on the south flank of this ridge, and typically the further one goes down on the flank, the warmer the temperatures and the more powerful the wines. The villages of Faugères and Fos and their vineyards are the highest in the appellation—as high as 350 meters—and Fos is the most remote in the far northeast corner of the delimited area. This is the home of Ollier-Taillefer, a domain run by siblings Luc and Françoise Ollier. 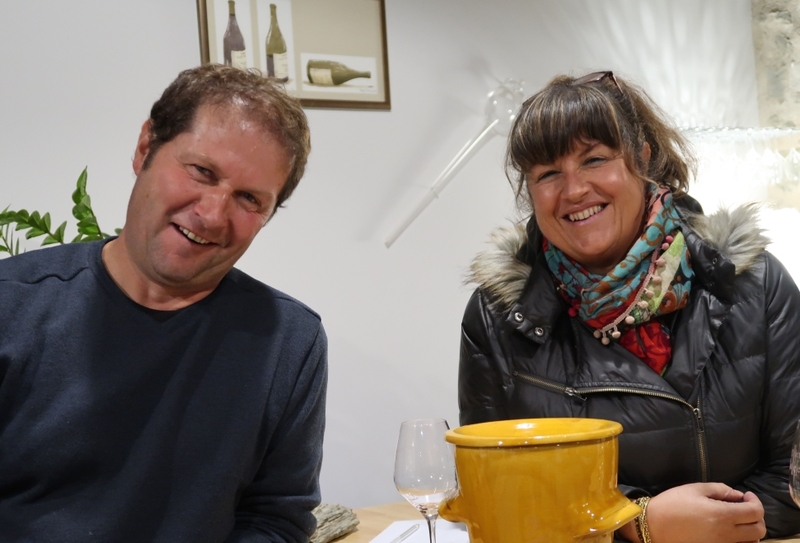 Their parents bottled their first wine in the mid-1970s (before their vows, he was an Ollier and she was a Taillefer), having come from four generations of growers in the region. The oldest vines Luc and Françoise farm today are Carignan, growing in a parcel planted by their great grandparents in 1910. These grapes go into their Grande Réserve cuvée. Luc joined Domaine Ollier-Taillefer in 1990. Eleven years later he took the viticulture on a sustainable path under the umbrella of the Terra Vitas agency. In 2003, after eleven years as the director of the Faugères syndicate, Françoise joined Ollier-Taillefer. In 2009 they went organic with their farming and the domain received certification three years later. 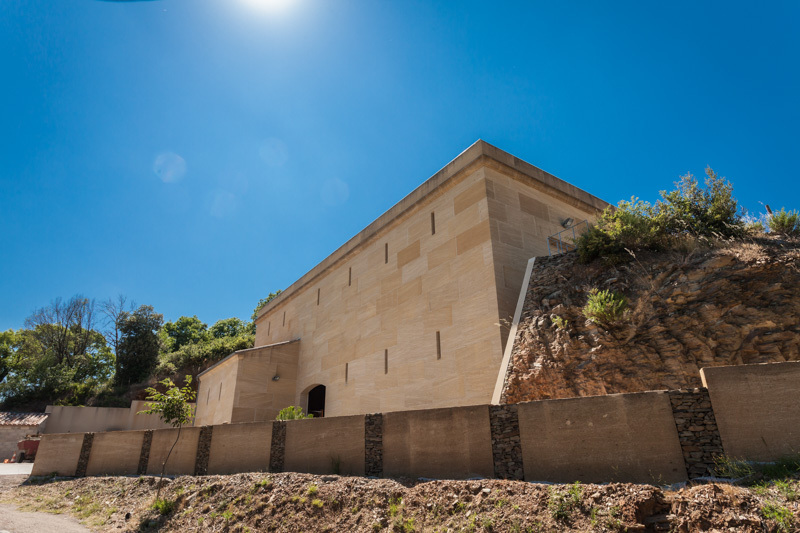 In 2012, with limestone from a quarry near the Pont du Gard, they built a new and quite beautiful cellar that uses a geo-thermal heat exchange to cool and heat the building. It backs up against a hillside, with its roof covered by a deep layer of soil for added insulation, and fundamental operations within are handled by gravity. All water used is captured and recycled. They farm 36 hectares (89 acres) of vines broken out among 50 parcels, each hand-harvested. A good half of that surface grows between 300 and 350 meters around Fos. The altitude automatically results in lower yields. It also allows them to make wines with high-toned aromatics and moderate alcohols (Grenache at their altitudes ripens fully at 13.5 degrees, whereas down the ridge at Antugnac, along the southern border of the appellation, similar ripeness translates into 14.5 to 15 degrees–an enormous difference). The resulting wine springboards right into the verdant lushness of garrigue that so characterizes the best of Languedoc’s wines and that Faugères captures so succinctly. Schist is an acidic soil but paradoxically produces wine with relatively low acid levels. That deficit, such as it is, is compensated for by the lift of minerality imparted by the schist into its wine. 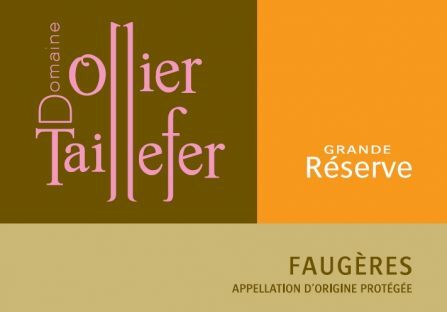 Ollier-Taillefer’s high elevation takes this one step further, making for wines with particularly fine balance between ripe fruit and degrees of alcohol. This is strikingly apparent in their flagship, the Grande Réserve, raised in tank and unencumbered by wood, a wine bursting with pure finesse. The written record first makes mention of a “de Falgarias” in 934AD, from Latin “Filicaria” or fern–today’s fougère in French. Maybe that’s where the village got its name, although there are no ferns to be found in the landscape today. At least one local historian believes that the name Faugères referred to beech forests, but likewise there are no beeches these days. Who knows? A lot can change in 1,000 years. 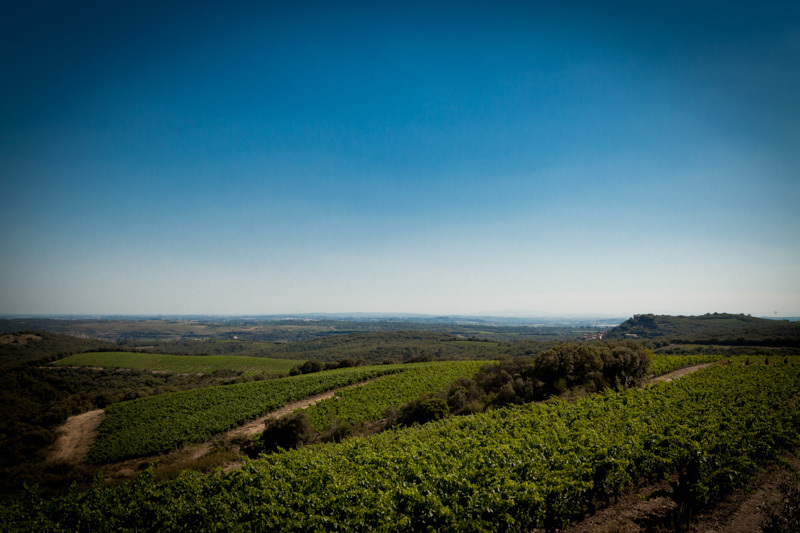 Compared to neighboring appellations, Faugères’s 2,000 hectares of vines is dwarfed by Saint Chinian’s 3,300 hectares immediately to the west, and Saint Chinian is far more diffuse with schist along its interior and limestone, clay, and sandy soils forming its lower zones closer to the plain. Minervois, further westward, is larger still at 5,000 hectares and even less homogenous. Photo of Françoise Ollier in winter courtesy of Jeff Bramwell. Video of the winery and the village of Fos. Cinsault, Grenache, Syrah, and Mourvèdre in that order Hand-harvested. The Grenache and Cinsault—the grapes with the least color—are pressed directly while the deeper colored Syrah and Mourvèdre are worked in a saignée method (which also gives more texture and aromatic complexity). This is a rosé with a beguiling pale color that belies its breadth and richness, and it’s a rosé that works at the table every bit as well as it does on the porch. Production averages 1,500 cases. Les Collines Rouge Grenache, Syrah, Carignan in that order. All de-stemmed. Hand-harvested, raised in tank, a wine that speaks transparently of schist and its dark depths; long, lithe, and deliciously Languedocien. Production averages 5,500 cases. Equal parts old vine Carignan, Grenache, and Syrah. In some years, a dollop of Mourvèdre. All de-stemmed. 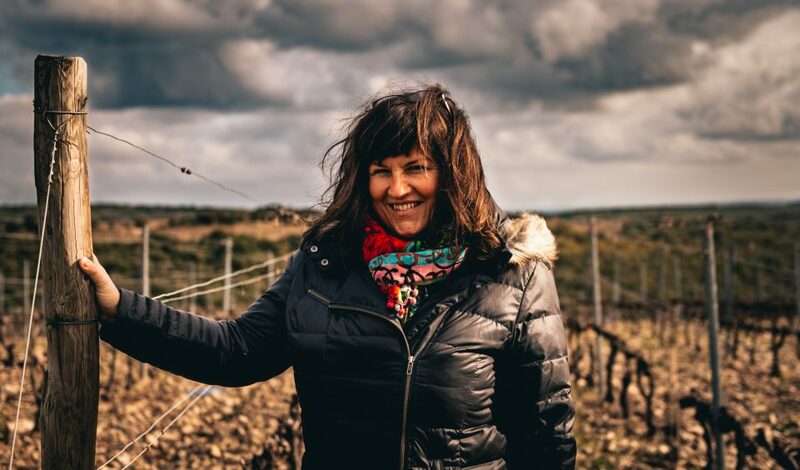 When critics speak of mistakes or faults in Languedoc's wines in general terms, the finger points first to oak, the misuse and overuse of which wipes out so much that is special about Languedoc wines—namely, the fragrant aromatics, and the sense of garrigue and soil from the terroir. The second thing they point to is brettanomyces. There’s neither oak nor brett in the Grande Réserve. Nary a splinter nor a cell. Aged on its fine lees during a nicely relaxed élevage, in this wine you have the potpourri of Faugère’s aromatics—its black olives, thyme, sage, sea salt, and on the palate the sense of licking black stone. This is what Languedoc and Languedoc alone can do so well. Average production is 2,500 cases. Equal parts Roussanne and Vermentino Appellation status was granted to Faugères for white wine in 2005 (red and rosé were accorded AOC in 1982) and only around 2% of what Faugères produces today is white wine. Ollier-Taillefer’s Allegro comes from 11 acres of vines and is raised entirely in tank. In some years the malolactic fermentation is blocked but often it’s not, and regardless the wine is shockingly fresh and pure for a white from the south-- there’s no sense of heaviness here. Production averages 2,000 cases.